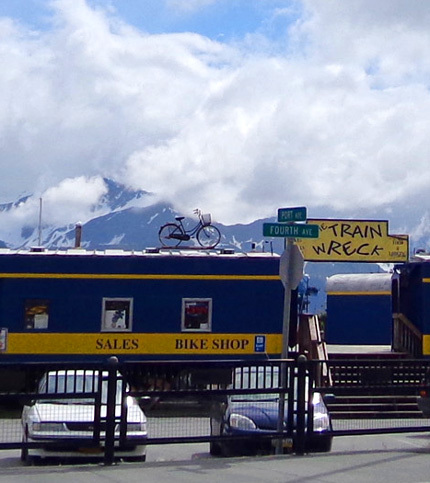 fun-loving Seward scene, you've come to the right place. 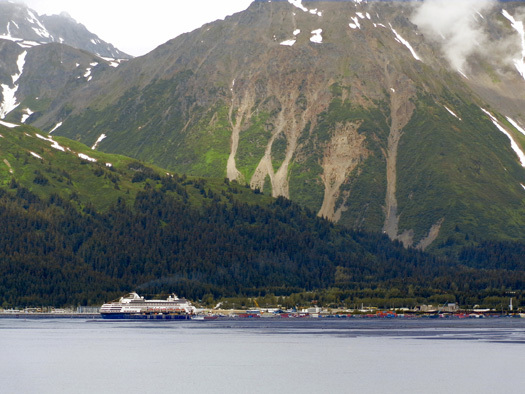 Alaska Starts Here® ." This morning we woke up to a few patches of blue in the sky – that’s always a good sign! We're a bit tired of clouds and rain. We did have more sunshine throughout the day but there were still more clouds than blue sky. Temps remained in the 50s F. with a little breeze. 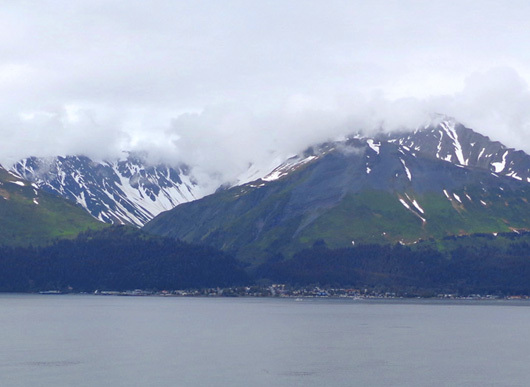 Not exactly "summery" but it’s the best weather we’ve had in Seward since we got here on Thursday. 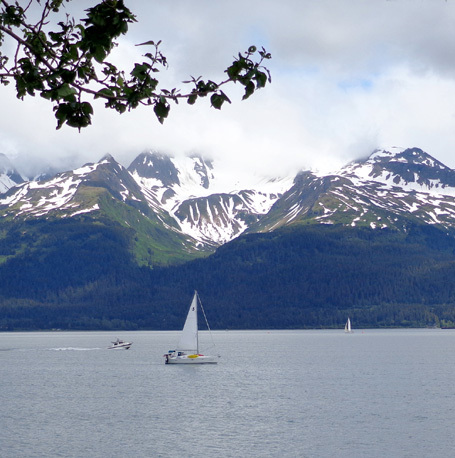 We're doing well with our informal "List of Things to Do and See in Seward." We checked off all but three of the remaining activities today -- the marine cruise, which we’re doing tomorrow, the SeaLife Center on Tuesday, and the hiker’s trail on Mt. Marathon if the trails are open. Unfortunately, Michael LeMaitre still hasn’t been found but since the large search for him is over, the non-race trails on the east side of Mt. Marathon may be open before we leave on Wednesday. across the bay. I think Mt. Marathon, site of the (in)famous July 4 foot race, is in the center. 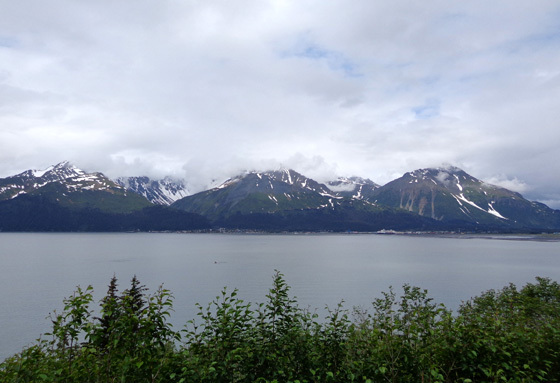 This entry includes photos and information about an interesting salmon weir we visited just outside of town, views of Seward from the other side of Resurrection Bay, the hike we took at Two Lakes Park, and miscellaneous scenes from the harbor, downtown, and residential areas. I'll focus on the colorful murals that chronicle various parts of Seward's history in the next entry. This morning we took a drive to the salmon weir on Bear Lake Road a few miles north of town. One college student was tending the weir. 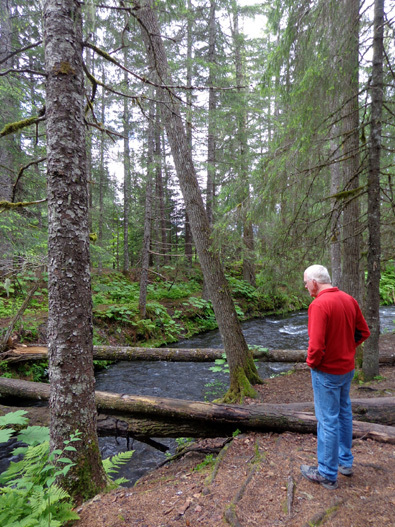 Jim and I watched a couple salmon try to get past some metal bars in the creek. We were curious how they get upstream past the obstacles. Four women arrived in a car; they were curious, too. I walked over to the young man, who was doing something on a computer, and asked him if he could come over for a few minutes to tell all of us what occurs at the weir. He agreed to do so somewhat reluctantly but he patiently answered all of our questions. 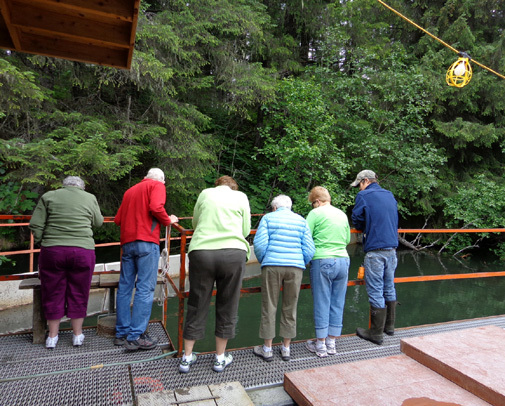 Jim's in the red jacket, looking into a large tank with salmon. The weir attendant is on the right. He was a little more talkative with Jim and me after the women left. We thanked him for taking the time to talk with us. 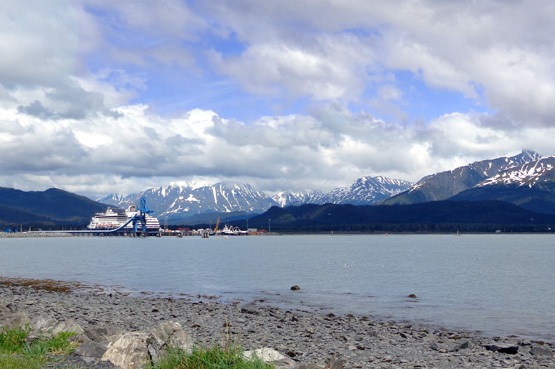 He grew up near here and is a fisheries student at a college in Juneau. This is what I remember from all the information he gave us. 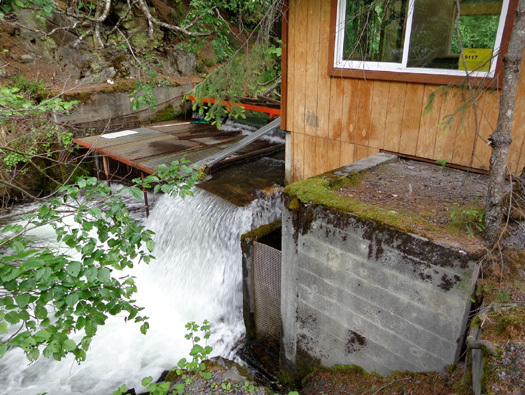 The weir catches all the red salmon that are swimming upstream to their spawning grounds at nearby Bear Lake in late spring/early summer (and silver salmon in late summer/early fall). 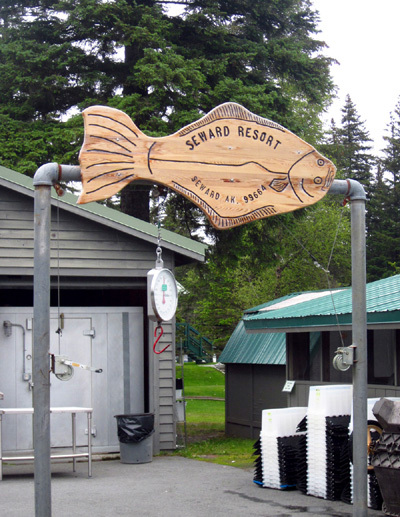 It is operated by the Cook Inlet Aquaculture Assoc. and monitored by the state. 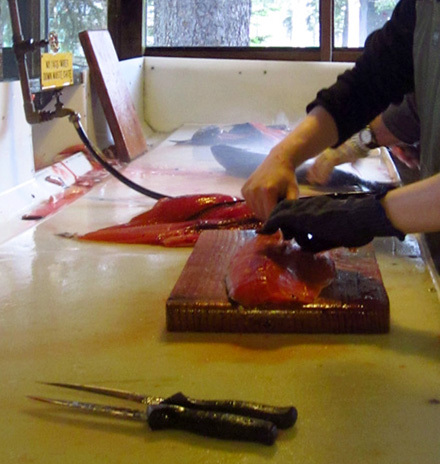 This year 6,000 male red salmon were allowed to pass through the weir to fertilize eggs. 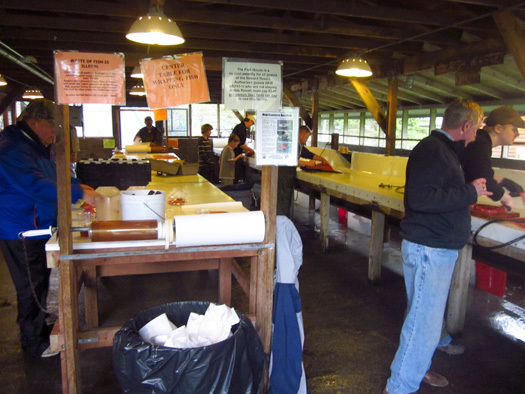 They are taken to Seward Fisheries (AKA “Icicles”) for processing. Six thousand females will also be allowed to pass through the weir to spawn. Another 400 females still need to go through. After those females are allowed upstream, the remaining will go to be processed. 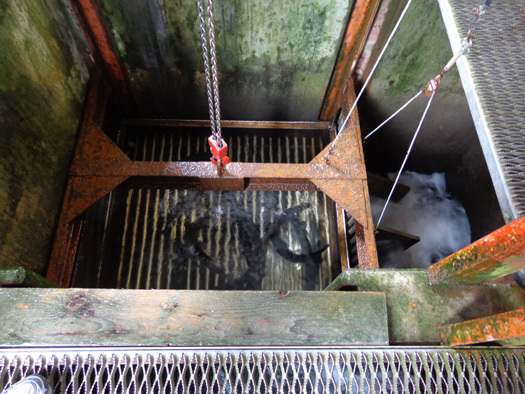 There’s also a problem with a “slime coat” that is killing some of the salmon that come through the weir. 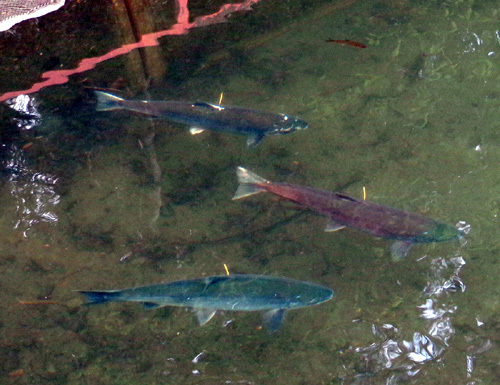 There were two salmon floating belly up that aren’t quite dead yet. I don't know if the two problems are related. After we left the weir we went across the road to a shady day use area next to Bear Creek. 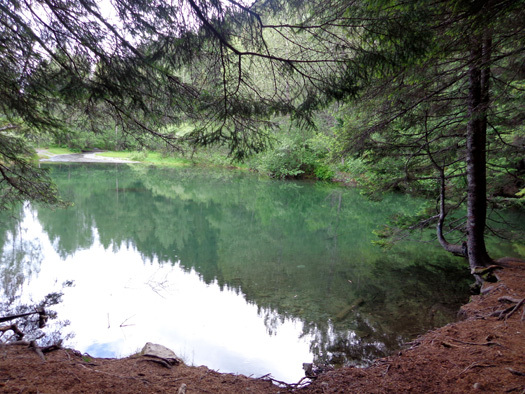 That’s one place visitors can watch bears catch the salmon as they’re swimming upstream. We were there only a few minutes and didn’t see any bears or salmon. Nearby Bear Creek RV Park uses this feature in their advertising. 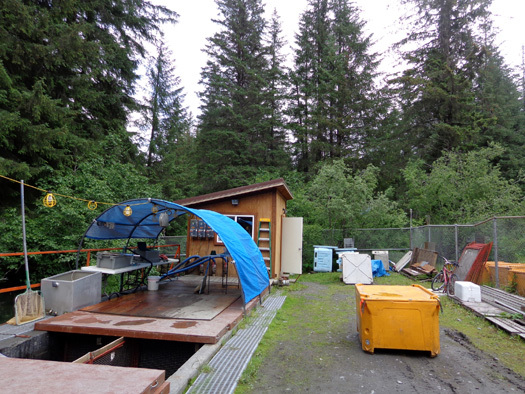 Campers can walk over to the creek to watch bears fishing when the salmon are running. SPEAKING OF SALMON . . . He said he’ll be smoking them so they’ll keep better during the winter than just freezing them. They’re easier to store that way, too. Since we don't fish we bought some fresh sockeye salmon fillets at Safeway today and froze them. They were about half the price there ($9.99/pound) as they were at a seafood shop on the harbor boardwalk ($18.95/pound) and looked just as good. We printed out a couple salmon recipes we found online that sound tasty and we'll try them soon. One is a marinade with pure maple syrup in it -- yum! That should be good either baked or grilled. There are several scenic overlooks along Nash Road where you can stop to take in the views and/or enjoy a picnic. One of the city campgrounds, Spring Creek, is located about five miles out this road. It is fairly remote and has no hookups but the views can't be beat. 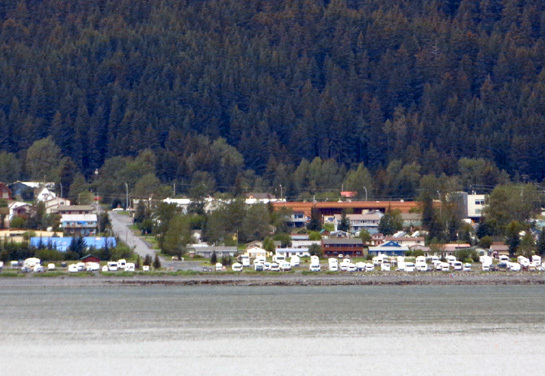 Lowell Point is a day-use area. Two trails start from there. 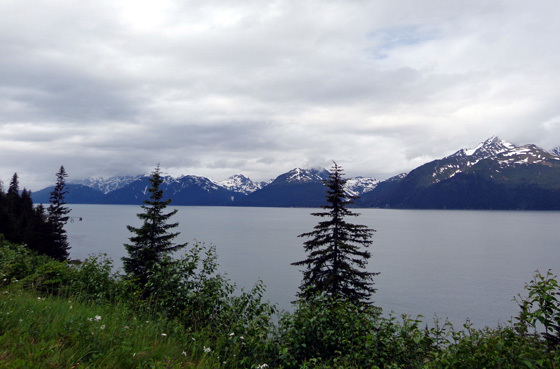 One goes to Caines Head, which has an abandoned fort that was a sentry for Resurrection Bay during WWII. A woman at the visitor center told us that the lower trail is currently impassable because of snowmelt. 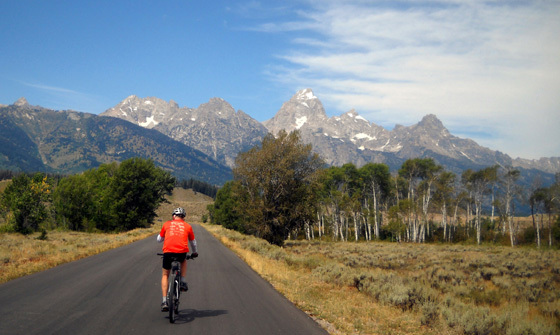 I doubt we'll go down the narrow, rutted, gravel road to see the view from Lowell Point on this trip. It's apparently a mess, too. Maybe next time . . .
After lunch we went out for a bike ride through town. I stopped to take more pictures of murals, old buildings, interesting houses and yards, and other things that caught my eye. 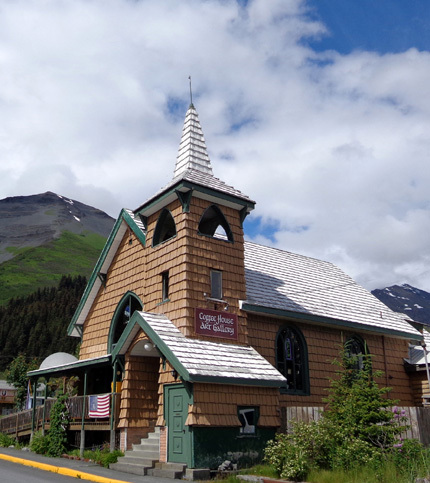 One of my goals was to find several more points of interest described in the Chamber of Commerce's walking map and a separate leaflet about fun things to do and see in Seward. By now I've found or done about half of the recommendations. 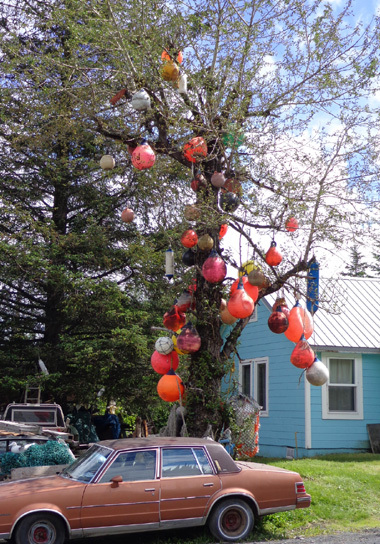 If you're driving, riding, or walking along 4th Ave. it's hard to miss the "Buoy Tree" in a residential yard -- as well as all the, um, collectibles in the front yard that I edited out of the photo! 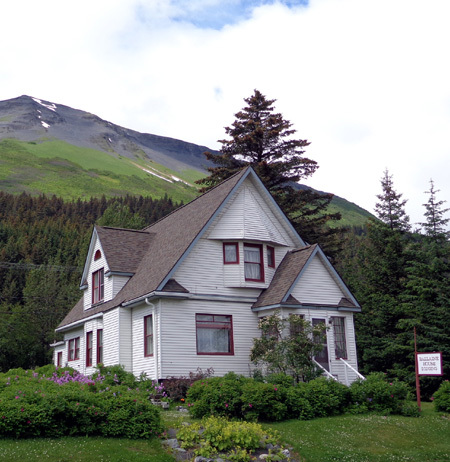 The Chamber of Commerce walking brochure describes it as "a whimsical commentary on Seward's marine roots:"
I love historical architecture so one of the streets I headed for was 3rd Ave. One of the blocks has several homes built before 1910 for prominent early citizens of the town. The houses were apparently so elegant compared to others in Seward that the block was called "Millionaire's Row," although they aren't nearly as large or pretentious as many homes of the same era in the Lower 48. According to the walking map/brochure, Frank and his brother John led the landing party of Seward's first settlers in 1903. Their goal was to build a railroad to the Yukon River. John founded Seward and chose the name to honor William H. Seward, who negotiated the purchase of the Territory of Alaska from Russia in 1867. The home is still privately owned and not open for tours, although the sign advertises "lodging." Two other historic homes on this block were owned by the railroad's construction engineer (the Cameron House) and the railroad's treasurer (the Stewart House). 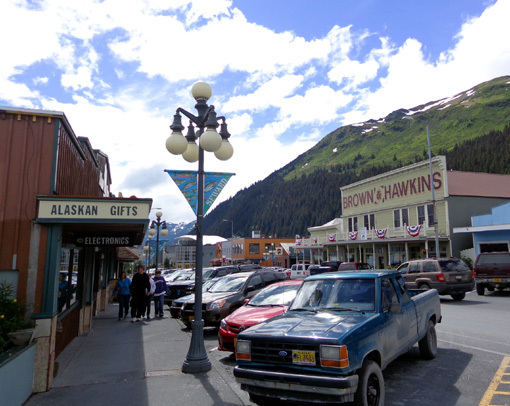 Several older buildings in Seward have been "re-purposed" like that, rather than building new. Good concept. 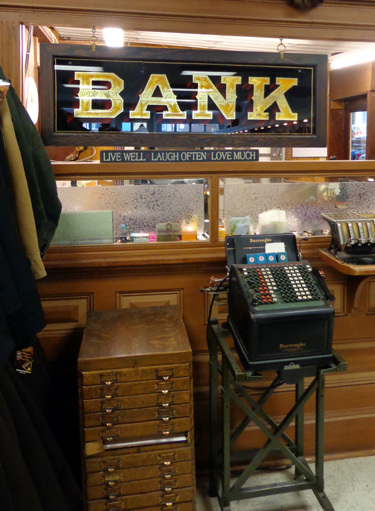 Built in 1907, Brown & Hawkins is reportedly the state's oldest family-owned retail business. The store has an old-fashioned soda fountain and makes various types of gourmet candy. 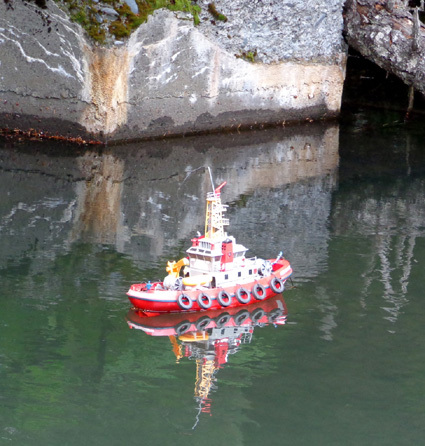 It also sells general merchandise, sports clothing and gear, Alaskan-made gifts, and souvenirs. A nearby building houses Urbach's Clothiers, which has been in business since 1915. It also maintains historical artifacts in addition to its wares. Still lots of clouds to the south but these RVers are enjoying the bay anyway. It was more sunny to the north and west of the bay; that's the cruise ship in the distance. While we were in the harbor area we verified that Kenai Fjords Tour Co. has our cruise reservation for tomorrow and plans to pick us up in a shuttle bus at the military resort. We bought our tickets at the resort, not directly from the tour company, so we could get a better discount. 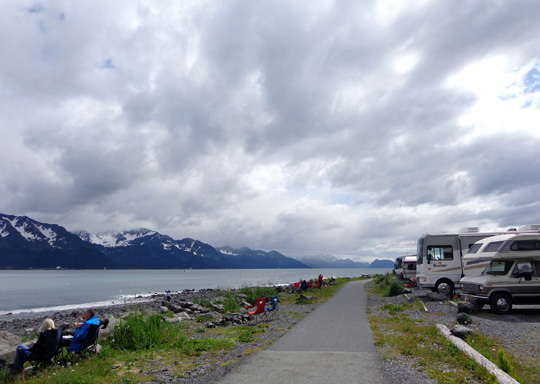 We also watched two videos at the Kenai Fjords National Park visitor center and saw parts of two other films there. They have a continuous two-hour loop with about eight different videos -- good free entertainment. After supper we drove a couple miles to Two Lakes Park, which lies between the lagoon/main drag through town and the base of Mt. Marathon. The lakes are fairly small. They are separated by wetlands that aren't currently very wet, despite all the recent rain and snowmelt. 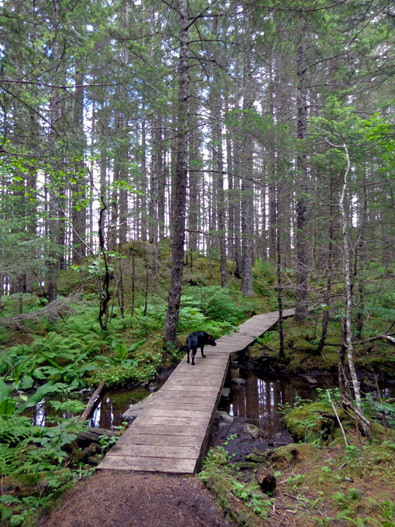 The rustic trail doesn’t go close to either lake for very long. It mostly winds through the forest. The one-mile loop was much hillier and more rooty than we expected, but dry. 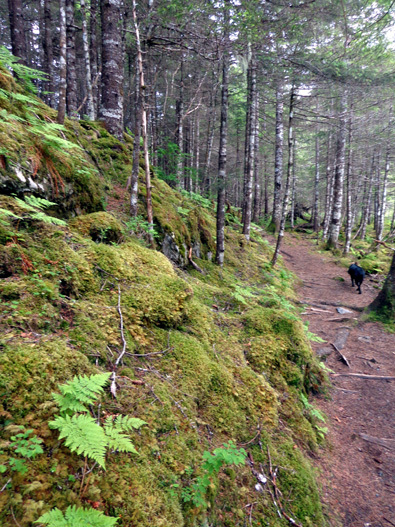 This city park is full of spruce, hemlock, black cottonwood, and sitka alder trees, as well as moss, ferns, devil's club, and other rainforest under-story plants. Signs warn visitors about moose and bears in the park but we didn't see any big critters.